The man's name was Anant Ram Gand and he was the father of five children. He was dragged away from his house before his son's eyes. He was baptized two months ago in the Evangelical Church, but his conversion was opposed by the village radicals. President of Persecution Relief: "We want freedom of worship". 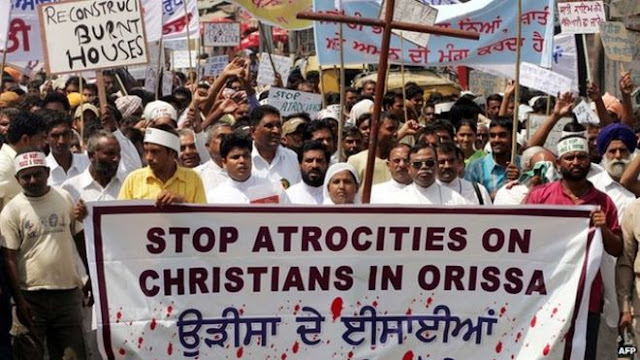 New Delhi (AsiaNews) - A Christian evangelical man was beheaded in Orissa because of his faith. Shibu Thomas, founder of the Persecution Relief network that deals with defending discriminated Christians in India, denounces it to AsiaNews. The victim was called Anant Ram Gand, he was 40 and was the father of five children. Thomas says that he "had converted to Christianity nine months ago and had been baptized for only two months. His conversion has aroused the ire of the villagers, mostly Hindu fanatics. They armed the Naxal [Indian Maoist guerrilla, ed] who physically committed the murder ". The Christian leader then declares: "As president of the group, I ask the prime minister and the Chief minister of the State to please order a probe. The government should provide compensation to the family and five small children. They should speak clearly against persecution of Christians and to protect freedom of worship. Enough is enough!". The murder took place on 11 February in the village of Raigarh Tehsil, in the district of Nabarangapur. The news was released yesterday by Persecution Relief, after a meeting with the Christian's family. The group reports that on the day of the murder of Sukbati (38), wife of the victim, went to the nearby village together with her four daughters (aged 13, 11, 3 and 2), while Anant, in the company of the son of 6 years in the name of Purno, he had remained at home. The child said he woke up at the sound of three men knocking at the door and shouting at his father. Then they tied his hands behind his back and dragged him away. The murderers did not stop even before the crying of the little one chasing them: drove off with ferocity, the three men told him not to follow them. At that point the child reached his uncle's house nearby and raised the alarm. Anant's body was found in the middle of a road, in broad daylight, beheaded. Previously, the skull had been smashed with a stone. The murderous fury was triggered by his conversion to Christianity nine months ago, followed by that of the whole family. According to the locals, the Hindu radicals of the village never accepted it, and used the Naxals to carry out the murder. In fact, in the past the man had expressed sympathy for the Maoist guerrillas. Thomas reveals: "He was never a part of the fighters, but the Hindus made the Naxals believe that the Christian would reveal their secrets to the police. Instead Anant Ram was no enemy of anyone". According to the Christian leader, the faithful was not a threat to anyone. On the contrary, he was threatened by the inhabitants, who "discriminated against him and did not allow him to collect water from the public well". After the conversion, the man had been banned from the village and had moved about a mile away. Anant belonged to the Indian Evangelical Team, (Ied). "Being a Christian today in India - Thomas says - means being harassed every day: if you pray in the family you are beaten, if you pray in a domestic church you are beaten, in the streets you are beaten. Article 25 of the Constitution [which protects the freedom of belief and the spread of the faith, ed.] Is not applicable for Christians in India. We want to be protected. Now the Christians of the villages live in fear".